I was in my local Joann's when I spotted these white Victorian buttons. They reminded me of a book I'd made a few years ago for a gift for my husband's grandmother. 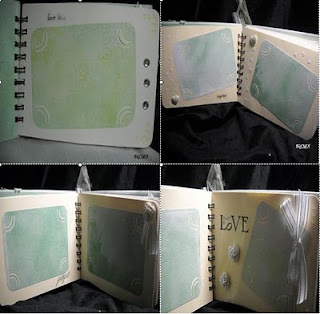 Knowing I had just made a green set of book covers and with the lace left over from that book project, I got the idea for the "A Love Like Ours" Guestbook Album. I wanted to keep it simple, elegant, and one of a kind. So with a few little hands, we started gathering up supplies and working out the design. This is what we came up with. I love the heart punch corners of the blank pages. Simple, yet elegant. Since they're card stock they can be used as signature pages or for photos. I couldn't resist ribbon ties and the bow on the back page. I left room on the top of the front cover for placing a set of initials or a monogram card. However, I think it looks nice the way it is too, don't you?